The combined technologies of Daifuku North America and Wynright provide unparalleled warehousing and distribution solutions. The video below highlights their joint capabilities regarding logistics solutions. Visit Daifuku, the world’s largest provider of material handling systems, in booth #S659. Check out our new high speed cross belt unit sorter and our latest autonomous automated guided vehicle. Wynright CEO Kevin Ambrose discusses the rapidly changing retail environment and how Wynright helps companies address the productivity challenges that shift presents in material handling. 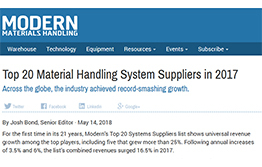 Daifuku has once again been recognized as the Number One Worldwide Systems Supplier in Modern Materials Handling’s annual “Top 20 Systems Suppliers” list. we are recognized by others. won a number of awards. Are You Asking the Important Questions? Find outHow can I do more with less? Fewer people/less inventory? Find outWhen is the right time to invest in higher levels of automation? Find outShould I retrofit or replace my current system? Find outHow do I manage for extreme seasonality? Find outHow do I make my operation sustainable? If these questions sound familiar, or if you have others, contact us or give us a call. Join the growing list of companies who are already realizing increased efficiency by design. As a vertically integrated manufacturer of branded basic apparel, Gildan Activewear had an ongoing commitment to serve their customers with ease and accuracy – so they chose Wynright’s experienced engineering and software controls team. Skechers USA needed to unify the inventory management and distribution of nearly 70,000 SKUs from five smaller locations into a new 1.82-million-square-foot distribution center. The new center needed to resolve issues dealing with manual handling, multiple touches, product flow and storage, and carton sequencing. Fill out the form below and we will contact you to address your concerns. We needed to satisfy wholesale, retail, and e-commerce distribution channels from the same inventory. The Wynright team provided a scalable and flexible solution that reduced our order processing timeline by two days and lowered the CPU of apparel by 20%. The customized solution that Wynright designed, developed and installed has enabled us to achieve near-Six Sigma shipment accuracy and customizable carton sequencing delivered directly into the truck. This type of process improvement has dramatically increased the efficiencies for both Gildan and for our customers while also significantly enhancing customer service. I think that Wynright did a great job with the project management piece, they had a terrific construction crew as well, and the communication between all of the people involved, as difficult as it was because of sheer logistics, was incredibly impressive. They have been absolutely terrific to work with. 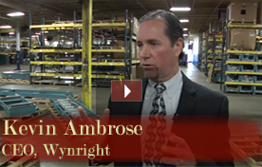 Wynright played an integral role in designing and implementing our automated inventory system. Together, we analyzed our inventory process and re- engineered it for optimum efficiency - to better position ourselves for today’s business as well as for future business. We use conveyor systems from several manufacturers. The Wynright systems are proving to be the easiest and least expensive to maintain. What do Apple and Amazon’s product strategies have to do with the selection of your distribution and fulfillment solutions? Shop Online for Spare Parts and Warehouse Equipment. We offer a comprehensive stock of common, competitively priced parts and warehouse items.